I’d like to tell you about a famous Michelin starred chef, Daniel Boulud, and one of his many restaurants. 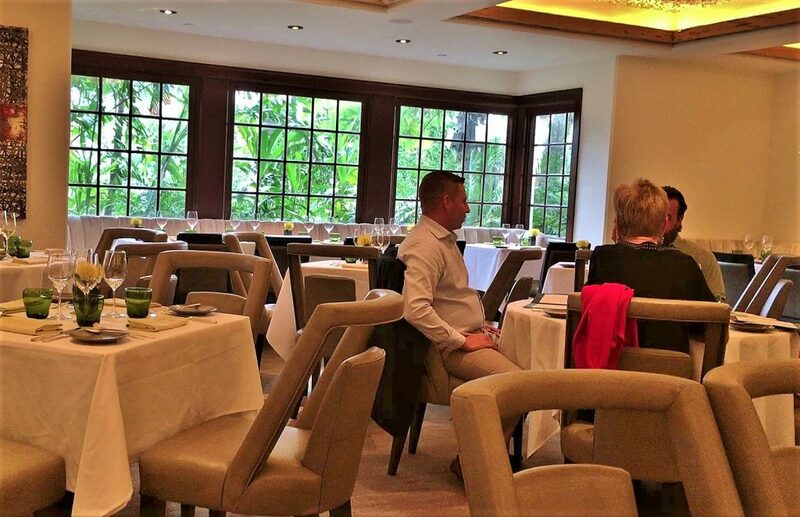 The restaurant is Café Boulud, Palm Beach. We went there in November on our last trip to the States. Chef Boulud, 62, is from Saint Pierre de Chandieu, southeast of Lyon, France. He was raised on a farm. (Farm to table dining was never a new concept for Daniel Boulud, nor anybody else from France.) He learned his trade by apprenticing in French restaurants and working with talented chefs like Georges Blanc, Michel Guérard and Roger Vergé. 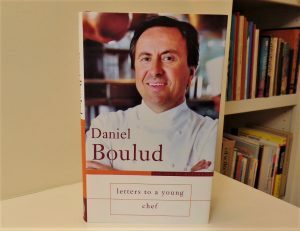 Boulud moved to New York City in the 1980s and eventually made his name at Sirio Maccioni’s Le Cirque, where he was Executive Chef from 1986 to 1992. He opened his first, his grandest, most gastronomic restaurant, Daniel, in New York City in 1993. Boulud went on to open other restaurants – Café Boulud, Bar Boulud, DBGB Kitchen & Bar, and more – all over the world. Daniel is the precious jewel of his restaurant empire. The nice thing about visiting the States for the month of November is that you get to celebrate Thanksgiving all over again. 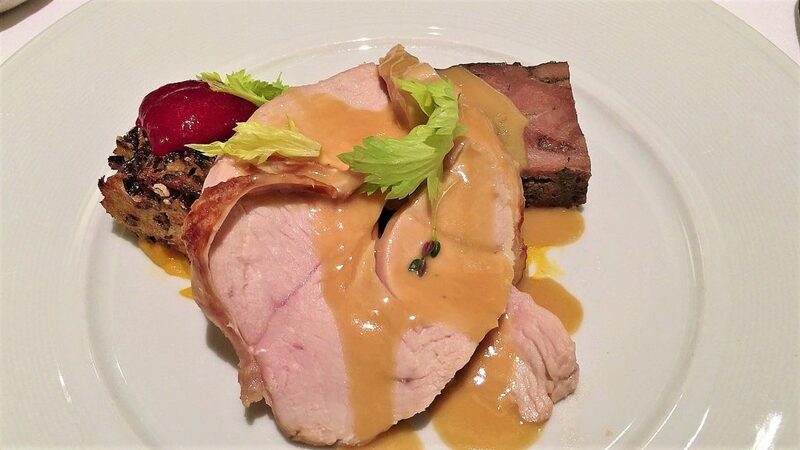 And, since fewer and fewer people can be bothered to cook a turkey, hundreds of restaurants offer the traditional meal, from my favourite Jewish deli to the poshest hotels and restaurants. When I saw an advertisement in the local paper for Café Boulud’s Thanksgiving dinner, I booked a table out of curiosity. (Price: $99 per person – $45 per child – excluding beverages, tax and gratuity.) 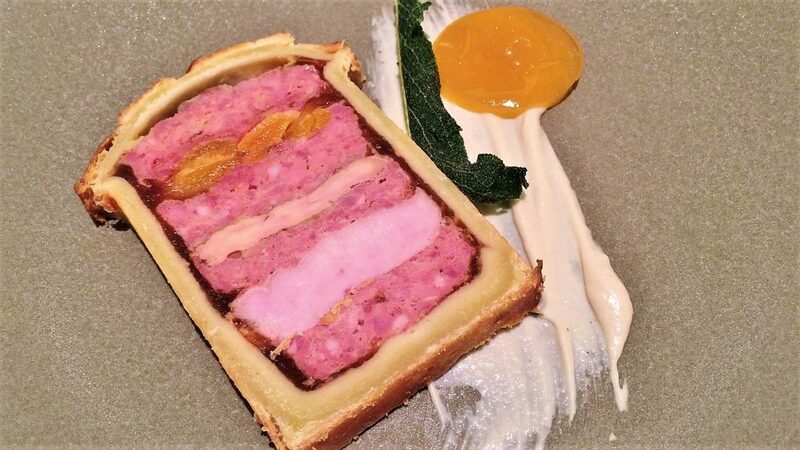 I wanted to know how a renowned French restaurant would present the traditional American meal. 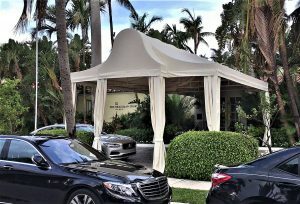 At 301 Australian Avenue in Palm Beach you’ll find The Brazilian Court. With its Spanish Colonial design, courtyards and fountains, the 80-room hotel has been a Palm Beach landmark since the 1920s. 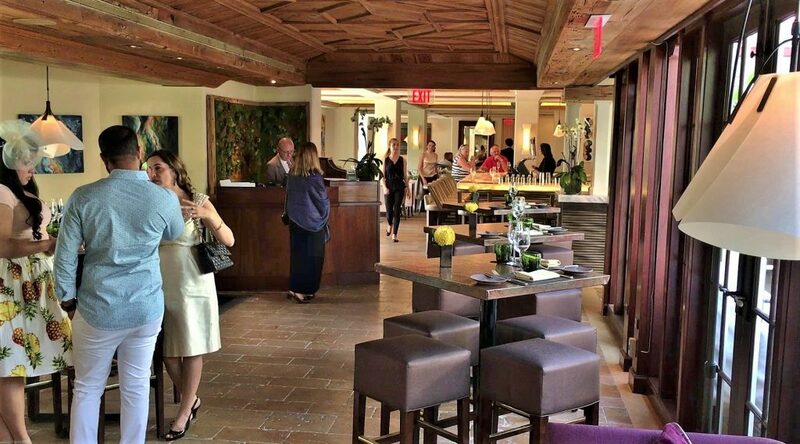 For the past 17 years The Brazilian Court has been home to Café Boulud, featuring the cuisine of chef Daniel Boulud, as prepared by Boulud’s Palm Beach team: Rick Mace, and pastry chef, Julie Franceschini. The restaurant was completely redesigned in 2017. The main dining room is less traditional, lighter, open and features wood floors and ceiling of pecky cypress and sea shells. Original artwork throughout the restaurant and hotel was selected by the Paul Fisher Gallery. Traditional table style has been maintained with stemmed wine glasses, silver flatware, and napkins on white cloth. 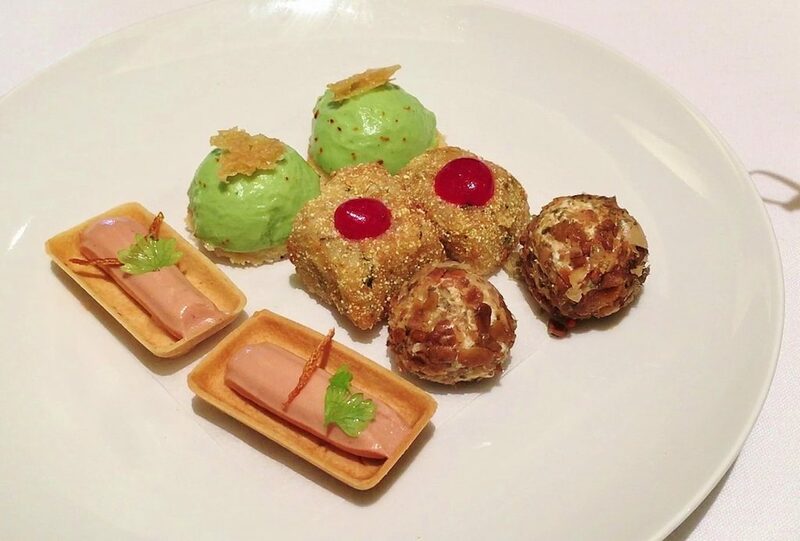 Our opening plate featured one each of four different canapés. Brightest looking were two scoops of spring green broccoli mousse, topped with discs of browned parmesan, tasting of broccoli, whipped cream and umami. Turkey and stuffing arancini, dotted with cranberry coulis, combined turkey meat, stuffing, onion and rice. Mini cheese balls tasted of goat cheese and pepitas – also known as pumpkin seeds. Finally, there were two short pipes of chicken liver mousse on tiny edible trays. An appetizer of pheasant and foie gras pâté en croûte, a popular cold starter in France, came on a stone coloured plate decorated with cashew aioli, fried kale leaf and an apricot. A terrine mold, lined with short crust pastry, is employed and filled with layers of pheasant meat, duck liver pâté and apricot. Pepper, white wine, bay and cloves are used for seasoning. The resulting slices, framed in golden brown pastry, are visually striking and delicious. Murray’s is an American producer known for its high-quality poultry “raised without antibiotics on family farms and fed an all-vegetable feed free of animal fats and animal by-products.” Main course was a plate of Murray’s wood roasted turkey with wild rice and rosemary stuffing and a side bowl of silken mashed potato. A few thick slices of juicy turkey breast, lightly covered with gravy, leaned against a slice of dark thigh meat – cooked separately in a pan with mushrooms – and a square of stuffing, topped with cranberry coulis, resting on buttery acorn squash purée. at home. Well, love was involved here too, I can assure you. 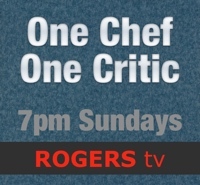 A combination of skill, quality ingredients and time produced food that was free of imperfection. I tasted refinement with every bite. 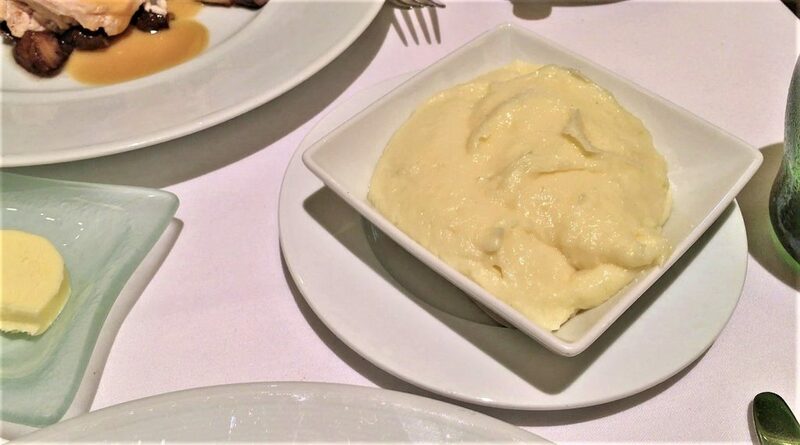 I knew I would never taste turkey more tender and flavourful, nor richer, smoother mashed potato. It was the same experience with every dish, including dessert. 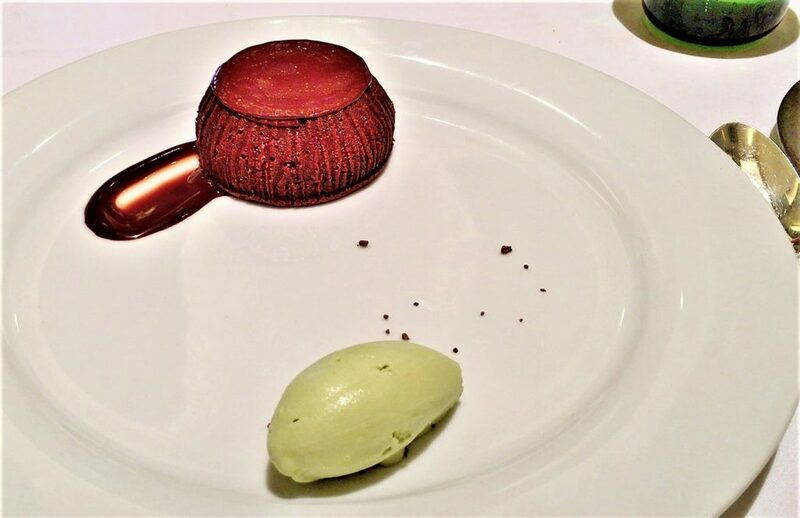 Upside down chocolate soufflé with a quenelle of pistachio ice cream brought our meal to a close. Boulud’s soufflé had a springy texture. Broken, it released a smooth, dark chocolate sauce. The ultimate chocolate treat compared nicely with the ultimate, ultra-smooth ice cream – both products made with equal care by Julie Franceschini.